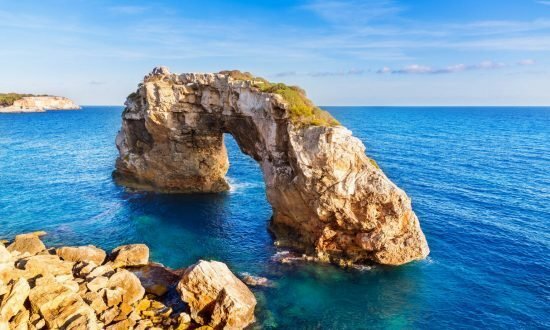 Whether you prefer lounging on the beach or engaging in water sports, visiting the islands’ nature parks or touring archaeological ruins, winery hopping or clubbing at exclusive local nightspots, there’s something for everyone in the Balearic Islands. The Balearic Islands are among the most popular sites in the western Mediterranean. You know the ones: Majorca, Minorca, Ibiza, and Formentera. Their long history stretches back to the ancient civilizations of Greece and Phoenicia, and there are traces of human habitation going back nearly 8,000 years. Too mainstream? The archipelago also contains many smaller islands, including Cabrera, just waiting to be explored. When the sun goes down, Ibiza becomes the world capital of colorful lights and beachfront dancing. There are also plenty of wineries on the Balearic Islands, and wine has been produced on these islands since Roman times. Looking to commune with nature? The four large islands alone have over 360 golden beaches. There are also several mysterious caves throughout the region, including the famous “Dragon Caves” on Majorca with their underground lake. The Cabrera Archipelago Maritime-Terrestrial National Park is home to many species of seabirds, and its waters teem with dolphins, whales and other marine life. No special precautions or vaccinations are required. The Balearic Islands have a robust public and private health-care system. Cover bare legs and shoulders when visiting churches and historic religious sites. The dress code is casual, but some nightclubs and restaurants require jacket and tie. Bars and restaurants in the larger cities stay open year-round, but some bars and restaurants in the tourist resort areas open only for the summer. Locals take a siesta between 1300 and 1730 hours, though many shops and restaurants in the main tourist areas stay open all day. Duty-Free and Basic Customs: Spain’s largest duty-free shop is located at the Son Sant Joan airport in Palma, Majorca, stays open year-round and sells popular brand-name items as well as a wide range of locally produced goods. Any amount over 10,000 euros (€), or the equivalent in any currency, taken into or out of Spain must be declared. Bans and Other Important Information: Export of endangered species without a permit is banned. The importation of meat and dairy products from outside the EU, unauthorized firearms and ammunition is also banned. Airport: There are three airports serving the Balearic Islands. Son Sant Joan (PMI) airport in Palma, Majorca, is the primary one. It is about 8 kilometers southeast of Palma. Rental Cars: Various agencies are present. Booking ahead during high season (June-September) is recommended. You will need a valid driver’s license to rent a car. Seat/safety belt use is required for all occupants. Children under age 12 cannot be seated in a front seat without using an age-appropriate child safety seat. Temperature: Summer average high = 30°C (86°F). Winter average high = 16°C (60°F). In winter, the nighttime temperature rarely drops below 0°C (32°F). Average sea temperatures range from 14°C (57°F) in winter to 26°C (79°F) in late summer. High Season: June-September. Avoid the crowds by visiting in the spring or fall (May or October) when the daytime temperatures are still warm and sunny. Winds: The risk of strong winds is highest Oct.-April. The Scirocco (southerly in spring) and the Mistral (northwesterly in autumn) are tempered by the Gulf of Lion and bring heavy seas. The Levant is an easterly wind that blows in the western Mediterranean Sea. 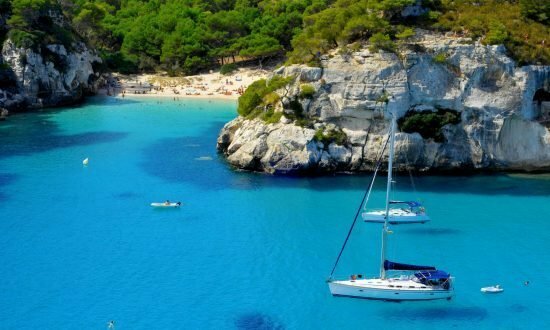 Minorca is known as the island of wind due to a cool, dry north wind called the tramuntana, which makes the island popular with sailors and surfers. Day 1: Walk along the cobblestone streets of Palma. Visit one of the most famous Gothic cathedrals in Europe: the Palma Cathedral, known as “La Seu,” which roughly translates as “the seat” and refers to the bishop’s seat. Take in Palma’s historic atmosphere and charm before boarding at 3 pm. Stock your provisions in Palma. Dine aboard or ashore at one of Palma’s great restaurants. Spend overnight aboard. Day 2: Cala Pi has a lovely beach and clear, calm turquoise waters that is suitable for swimming and snorkeling. There is a beach bar and three restaurants in the area plus a small supermarket and a pharmacy. Centuries ago, pirates were a problem in this area, and the remnants of a medieval watchtower still remain. This is a very popular anchorage but keep in mind that Cala Pi is a very narrow cove. Day 3: After a leisurely breakfast, set sail for Colonia Sant Jordi. Colonia is known for its beautiful white-sand beaches, including Es Carbo, frequented by the Spanish royal family, and Es Trenc, a 2-mile-long natural and more isolated beach with lovely golden sand and crystal clear waters. In town, there are many popular restaurants and tapas bars along Avinguda de la Primavera (Primavera Avenue) for lunch or dinner. A good, sheltered place to anchor for the night lies between the islets of Gabina and Redona, but take care to avoid the sand banks and rocks in this area. Day 4: Sail north and enjoy the scenic coastline on the way to Cala Figuera. Known to the locals as “Little Venice,” Cala Figuera is a quaint and more secluded anchorage along the southeast coast of Majorca. The port is still primarily a traditional fishing community with picturesque whitewashed cottages and boathouses that stretch down to the water’s edge. Eat lunch or dinner aboard and enjoy the quiet, natural setting, or try one of the local dishes at a café or restaurant near the marina. Day 5: On the turn trip from Cala Figuera, there are a number of small coves that may be accessible for anchorage in good weather. 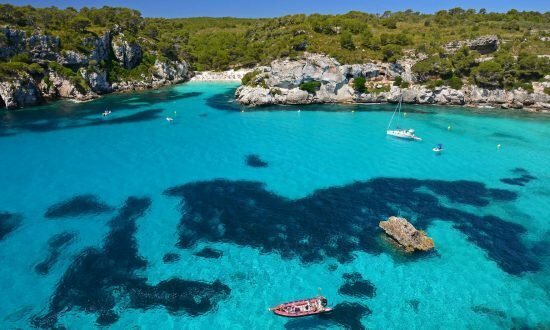 One is Calo des Moro, which has a sandy bottom and clear, turquoise water and a nice, small beach. However, there are no services available here, just a nice place to swim and snorkel. There are anchorage areas east of Colonia between the islets of Guardis and Moltona, but with the anchorages between Gabina and Redona, care must be taken to avoid sand banks. Day 6: Heading west from Colonia, you’ll discover the quiet port village of Sa Rapita. Its lovely beach, named S’Arenal de sa Rapita, stretches over half a mile from the port to the small village of Ses Covetes. A pure white, sandy beach rings turquoise blue water that is shallow and perfect for windsurfing. A beach bar and restaurant are near the port end of the beach. Day 7: On the return trip to Palma, you’ll see the beautiful, steep cliffs of Cap Blanc with its lighthouse. Much of the coastline in this area is protected and has not fallen prey to development. Rocky inlets and secluded coves dot the landscape. Calo des Cap d’Alt and Cala de Cap Falco are two good examples. Both offer crystal clear waters that are ideal for swimming and snorkeling. Day 2: After a leisurely breakfast, set sail for Andratx. Along the rocky coastline, you’ll pass spot Cala Portals Vell beach. It’s popular with sailors and offers dinghy service ashore if you want to eat at the restaurant. Rounding the cape you can try the golden, sandy beach at El Toro, which offers calm waters protected by Port Adriano. Once you reach the harbor of Andratx, one of the prettiest in Majorca, you can anchor there for the night. Day 3: As you head north, you’ll encounter Sa Dragonera (The Dragon), which is the main island off the coast and home to the Sa Dragonera Natural Park with its huge colony of seagulls. There are two good spots for anchoring on the east side of the island, though they should be used only when the sea is calm. Eat lunch aboard. Along the way, you’ll pass by Cala de Valldemossa where actor Michael Douglas owns in impressive home. Anchor in the port of Soller for the night. Day 4: After breakfast aboard, visit the picturesque port of Soller where you can climb the El Fara lighthouse. Or travel inland a short distance via a vintage tram (nicknamed the “Orange Express”) to visit the town of Soller with its ancient olive trees and fragrant orange groves. The valley in which the town is nestled and the surrounding mountains are a UNESCO World Heritage Site and a favorite destination for ecotourists. Eat lunch in one of the local tapas bars or in a café. In the afternoon, there are also two nice beaches at either end of Soller Bay for swimming and sunbathing. Day 5-6: Eat a hearty breakfast, and then sail to the port of Pollensa at the foot of the Tramantura mountain range where you can anchor for the night. Along the way, you may want to stop at Cala Sa Calobra, a pebble beach and a small cove wedged between two cliffs. Nearby, the Torrent de Pareis (Paradise Stream) has carved a deep chasm in the cliff, which has its own pebble beach. Day 7: The village of Pollensa is a quintessential Majorcan town where locals gather at the Cafe Espanyol after church on Sunday to visit with one another. 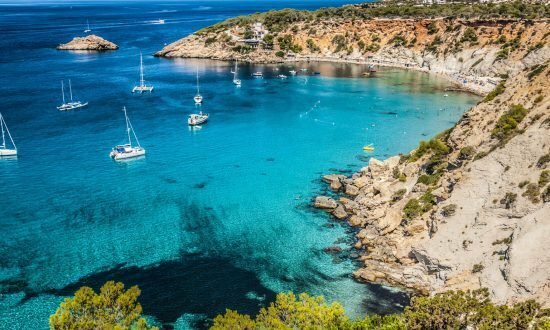 If you’re searching for the perfect beach, head north to reach the beautiful sandy beaches of beaches at Cala Agulla. Go ashore to relax on the beach and swim or hike up to the Capdepera lighthouse at to enjoy the panoramic views. It’s a short sail to the resort at Cala Ratjada where you can eat dinner and anchor overnight. Day 8: Named after Jesus Christ, Porto Cristo’s natural harbor has been sheltering fishing boats for centuries. Today, this peaceful fishing village and its harbor cater to visitors from all over the globe. There are popular beaches near Porto Cristo, but there are plenty of alternatives as well. Glass bottom boat tours are popular. Europe’s largest underground lake, Lake Martel, is a relatively short walk from the Nautico Marina area (or you can hire a taxi). The lake lies in the Cuevas del Drach (the dragon’s caves), a large, limestone cavern system. There are 1-hour tours of the impressive stalactite formations, and visitors are often treated to short classical music concerts by musicians who take advantage of the fine acoustics. There are charming cafés in the Placa del Carme as well as restaurants overlooking the marina. Day 9: Porto Colom’s large, natural harbor provides excellent and safe overnight anchorage. Porto Colom was named after Christopher Columbus and still retains the feel of a quaint fishing village. A nice nearby beach can be found at Platja de s’Arenal, which is divided into s’Arenal Gran and s’Arenal Petit. 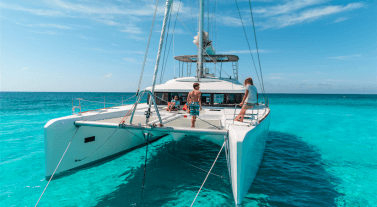 S’Arenal Gran has good underwater conditions for anchoring boats. The beach is both sandy and rocky and is sheltered from the Mediterranean’s winds and waves. Day 10: Head to Cala Figueras and enjoy the scenic coastline along the way, part of which belongs to Mondrago National Park. You can stop at Cala Mondrago a small, beautiful beach with clear deep-turquoise water that is great for swimming and snorkeling. This beach has a restaurant. Nearby is Cala s’Amarador with its white-sand beach edged in pine forests. Both coves have depths of up to 20 feet and sandy bottoms, but they are exposed to east and southeast winds. If needed, there are port facilities nearby in Porto Petro. Dock for the night in Cala Figueras. Day 11: The port of Cala Figueras is still primarily a fishing community with picturesque whitewashed cottages and boathouses that stretch down to the water’s edge. Eat dinner aboard and enjoy the quiet natural setting, or try one of the local dishes at a café or restaurant near the marina. Day 13-14: Colonia Sant Jordi & Palma – Enjoy another day at the beach and bring a picnic lunch. This time, visit Es Trenc, a 2-mile-long natural and more isolated beach with lovely golden sand and crystal clear waters. There are many popular restaurants and tapas bars along Avinguda de la Primavera (Primavera Avenue) for lunch or dinner. After an early breakfast on the following morning, set sail for Palma. The Port of Calanova was inaugurated in August 1976 by the King and Queen of Spain. It is one of the leading nautical sports centers and an important venue hosting regattas. It takes advantage of a splendid Mediterranean climate, clean waters and moderate steady winds. It offers all possible services so sailors’ only concern is to enjoy the sea. 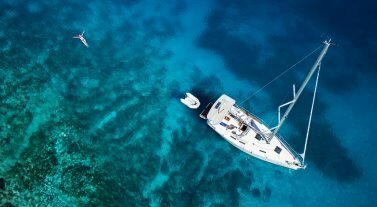 With the new project and the new moorings distribution, Calanova will host boats from 4 to 25 meters Calanova is located in the city of Palma de Mallorca, not in the city center but between the beaches of Cala Mayor and Illetas.